At the beginning of Rembrandt’s J’Accuse, Peter Greenaway’s ferociously original docu/lecture/rant regarding Rembrant’s The Nightwatch, Greenaway delivers a mini-essay on visual literacy. Specifically, society’s lack-there-of. He argues that all of their lives, western audiences are taught that visuals are subservient to the written word. While we’re all encouraged to scrutinize novels, plays and stories for parallels, juxtapositions and interesting symbolism, we just don’t do this with visual mediums. Not to the same degree. Not unless it’s made incredibly obvious. This, if you take Greenaway at his word and I tend to, is the definition of cultural tragedy. Our lack of visual sophistication and, yes, literacy, means missing huge pieces of the puzzle when it comes to some major works. Not just in the world of painting, but in photography, in fashion and perhaps most importantly in cinema. Nicholas Roeg is a director whose films invite more visual scrutiny than most. He is, like Brian De Palma, first and foremost a visual stylist. A director who pushes the specific medium of cinema to its furthest regions. A director for whom form is content and content is form. 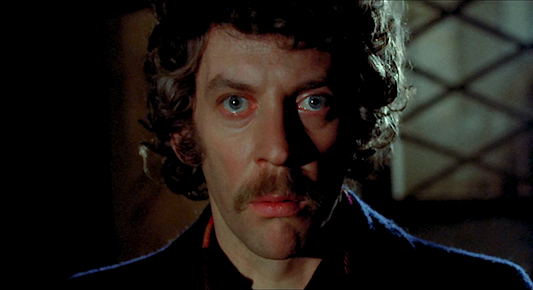 1973’s Don’t Look Now might be the best example of Roeg’s singular style. 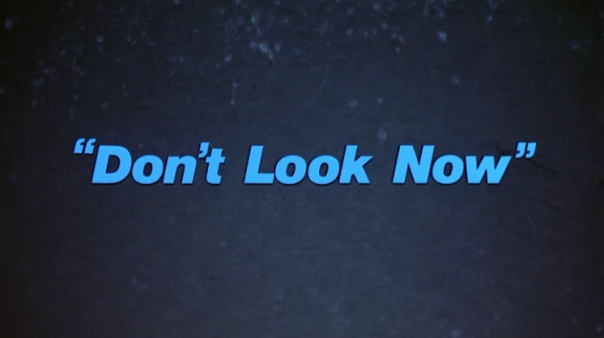 Don’t Look Now is an experience like few others – it explores characters with incredible depth and feeling. But it achieves this effect through pure use of film grammar: cinematography, editing, camera placement, art direction. It comes very close to being one of those movies – like the Road Warrior or Eraserhead – that could work without dialogue. The story is primarily one of grief and loss: Donald Sutherland and Julie Christy play a well-off married couple who suffer immeasurable tragedy when their daughter drowns in a pond. The rest of the story deals with how they come to grips with that loss: what it does to them both personally and as a couple. This plot description doesn’t sound like an occult thriller, but that’s exactly what Don’t Look Now is. Sutherland’s character, John Baxter, takes on a commission to restore church in Venice. And as the couple make their stay in a decaying, shadowy version of the italian city, they seem to be haunted by a combination of premonition, coincidence and pure dread. Laura, played by Julie Christie, falls under the spell of two psychic women – the blind one “sees” – who tell her that spirit of her dead daughter there is with her, happy and still wearing the brightly colored mac she drowned in. John meanwhile retreats from all of this under a blanket of denial, alcohol and guilt. But as the film gradually reveals itself, we start to wonder whether or not John also possesses the gift of psychic insight, even if he does his best to deny it. All of these threads plummet and twist toward an ending as tragic and inevitable as it is deeply weird. There is a maze like structure to the film. The editing is constantly shifting our notions of time and space. And this is reflected in the film’s spiraling, Escheresque vision of Venice. The city isn’t the tourist trap novelty that we’ve seen across so many different representations over the last 100 years. This is a darker version of the city. In Don’t Look Now, it serves as stand in for the state of the Baxter’s marriage: beautiful but crumbling. A once proud and majestic thing, whose time has simply come and gone. It is less a city intact, than a large graveyard or ozymandian metropolis. John and Laura are constantly finding themselves lost among the alleyways and stairs and bridges. Not sure which way to turn, no matter where they go. Frame by frame they and by extension, we are subject to a creeping sense of confusion and recursion. As though the city exists in some dream realm where the normal rules of geometry and architecture have been perverted (in fact during the opening sequence the camera lingers, if only for a second on a book called Beyond the Fragile geometry of Space, foreshadowing the Baxters’ journey into the dreamworld we find awaiting them in Italy). 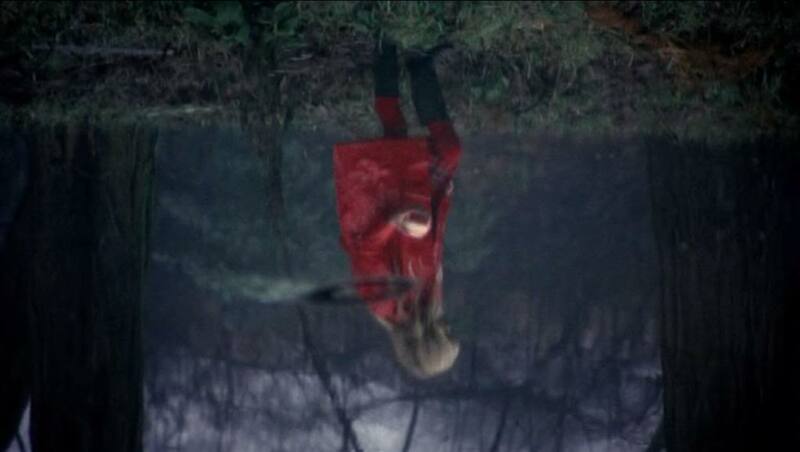 Much has been made of the use of color in Don’t Look Now. I won’t go too far into it. Suffice to say that from the first few seconds – in which we are introduced to the Baxter’s daughter frolicking on the English country side in her bright red mackintosh – the alarm bells already begin to ring in our minds. The color is so clearly called out it must have significance beyond simple aesthetic choice. And within moments the hunch proves correct as we cut inside to see John Baxter, submerged in work, but suddenly fixated on a red hooded figure in one of the slides he’s viewing. The Red motif shows up in too many shots to count. That crimson jacket seems to John wherever he goes. A constant reminder, haunting his mind and his world. Toward the end of the film it becomes almost overwhelming until finally it becomes not just the color of his daughter’s death, but the color of his own. Back to that opening: it’s simply a virtuoso display of film technique. Roeg uses editing to give us a sense of two worlds interacting with one another yet existing in separate spaces. What plays out in one space seems to parallel in the other. It’s a game of refraction between these two worlds. 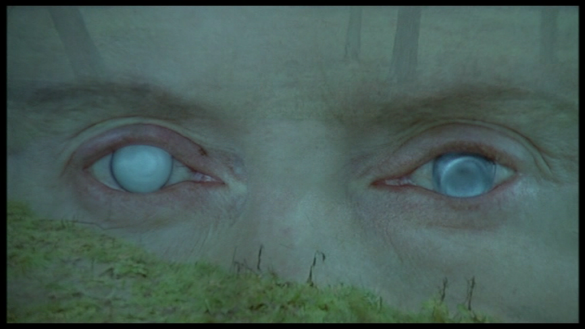 And Roeg positions Sutherland the bridge between both. But with tragic consequences he’s unable to understand the significance of what he sees. This lack of understanding is central to the events that unfold over the course of the film. in the alien landscape of Venice, the couple find themselves mixed up in misunderstanding after misunderstanding. There is the language barrier which keeps them from ever having a crystal clear grip on their surroundings. But there is also a sense that they are somehow out tragically of their depth. That it’s only a matter of time before the creeping black waters of the venice canals swallow them whole. One way this is achieved is through the truly strange way that people around them act. There is a particularly stressful section of the film toward the end where John goes to the police, convinced the psychic women have kidnapped his wife. He meets with an italian police detective who at once menacing, nonsensical and apathetic to the entire thing. The fact of the matter is that Roeg hired an actor who did not understand english at all and had him read the line phonetically. but he’s only one example. through ought the film it feels like everyone knows more than the Baxters. there seems to be a sinister motivation behind every smile. Every offer of goodwill feels like a trap. Take the scene in which the Psychic women offer Laura a glass of whiskey. Roeg directs the actors in such a way that we can;t help but be suspicious of the drink. Is it drugged? Poisoned? Are these two actually robbers or worse? Yet nothing happens. Laura doesn’t drink the whiskey, and so we’re left on edge, suspicious but with no proof. And thus tension continues to build, winding us tighter and tighter. All of this adds up to an incredibly effective experience. But that’s not to say it’s a perfect one. let’s stop heaping on the praise for a second and talk about a few bits that aren’t quite so great. First, it must be said that, like the Matrix Reloaded, Don;t Look Now is one of those films that has Not Aged Well. The love scene, which was a sensation upon release and even after forty years still feels explicit, also feels strangely dated and awkward. The effect of inserting cuts of Laura and John dressing separately during the scene is very cool (Soderberg obviously thought it was cool enough to homage in Out of Sight). But the music choice, Pinno Dinaggio’s rather insipid love theme, uses a truly cheeseball flute and guitar. And it undercuts the power of the the whole sequence. And then of course there’s the ending. Not to spoil the movie for anyone, but a killer dwarf basically comes out of nowhere, hacks into John’s neck with a big knife and then watches as his life drains out of the floor. This is without a doubt the most argued about section of the entire film. It’s definitely an ending I don’t think anyone saw coming. But just because it’s a twist doesn’t always mean it’s effective. For me the effect was more one of confusion than the terror I think was intended. And no matter how many times I see it, I am left wondering what Nicholas Roeg was trying to accomplish. Whatever the intention of the ending, the film as whole stands as a monument to cinema as a unique visual medium. As has been said in many other places, it’s really one of the most intimate and accurate depictions of grief ever put on the screen. And above all, it’s an occult thriller as powerful and strange as they come. 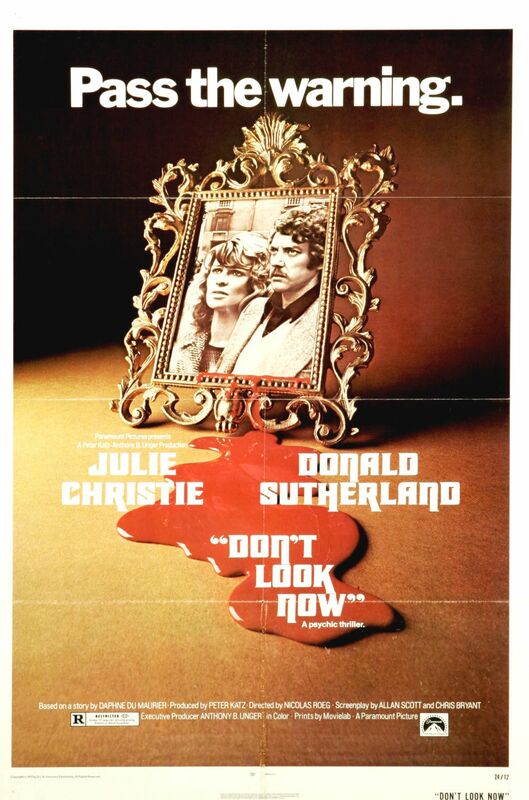 Don’t Look Now is available to stream in a very nice print via Amazon Prime video.